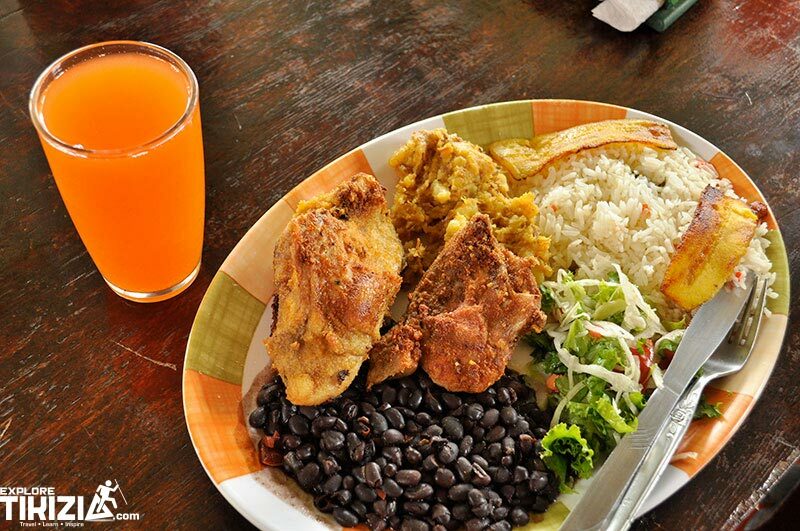 As a quick introduction of Costa Rican food, let’s begin with two main facts: 1. Costa Rican food isn’t overly spicy like Mexican food as many people think. 2. Yes! It is true that we eat a lot of rice and beans and have fresh fruits. Our food may not be as exotic as other countries’ traditional dishes, but there’s something decidedly comforting about Costa Rican food. According to urban history, Gallos got its name from an ex president, Rafael Yglesias. His nickname was “Gallo,” which means rooster. He had lived in Europe, and right before presidential elections, he had the tradition to invite people for a meal. His cooks were trying to replicate the “Canapes” that are served in Europe. Canapes usually use bread or crackers, but the cooks used tortillas and beans to get as close to a canape as they could provide to the guests. Later, cooks started to change the ingredients, and now you can put cheese, meat, eggs in Gallos and and mix it in whatever way you prefer. We learned more about the history of “Gallos” at Corso Lecheria, this plate is their specialty. You have probably heard about Peruvian Ceviche. Ceviche is raw fish cooked in lemon juice, but it is more than that. Costa Ricans have our own version of ceviche—in fact,most Latin American countries have their own version. Ceviche is best made with extremely fresh fish. The ingredients we use are: Onion, sweet pepper, cilantro, fish and we add ginger ale to marinate the ingredients and and lemon juice to cook them. These details make ceviche a very different dish from raw sushi. Many people feel safer eating ceviche, as its citrus preparation is believed to kill any diseases carried by fish. Finally, we put ketchup and mayonnaise or spicy sauce on the fish to get the final taste. There’s nothing that says “Costa Rican Food” like rice and beans. Costa Rican food often revolves around rice and beans, such as Gallo Pinto, a dish that translates to “Spotted Rooster.” Gallo Pinto is a dish that includes black beans at a three to two ratio to rice. It also has onions, garlic, and salt. People often add Salsa Lizano to get extra flavor. Sour cream can also be added. In the past, most jobs required hard physical labor, so a big breakfast with Pinto and coffee was crucial to get through the day. Gallo Pinto with tortillas, plantains and … Meat! Lunch is Costa Ricans’ main meal during the day, so we need a big lunch. “Casados” are rice and beans again but separated and accompanied by meat, salad and plantains. Chicken, pork and beef are the more popular meats. Other staples of Costa Rican food choices include fresh fruits and vegetables such as tomatoes and plantains and a variety of beans and rice. The name “Casados” is because the relationship between the beans and the rice is like a marriage (Spanish: Casado). Also, an old Costa Rican story says that when the farmers at the fields meet for lunch time you can tell who is married and who is not. The married ones brought rice and beans and meat and salad while the single farmers only have a small gallo. One of our favorite local places for eating “Casados” and “Gallo Pintos” is Cafeteria Flory in San Ramon. Casado de Pollo and natural fruit juice! The famous Rice with Chicken. This dish is usually cooked using natural flavors like onion, pepper, garlic and cilantro (Costa Ricans love to cook with cilantro, btw). Then you add the chicken and rice with tomato sauce or annatto and voilà!!! Costa Ricans often eat arroz con pollo for dinner. It’s a quick and easy recipe that represents our culture in birthdays, parties or weddings. This dish can’t miss. It even became the joke and called it “arroz con siempre” (rice with always). There are many more options for traditional Costa Rican food. It was hard to come up with the top five, but these are the ones I most encourage visitors to try to get a taste for Costa Rican food. Costa Ricans definitely love food. In our culture, love is expressed through the food. So I highly encourage visitors to try food in a local restaurant like a soda, where usually the cooks are ladies who cook with that homemade-mom love. If you want to find a good place for local food, just ask a taxi driver or someone in town which place is their favorite soda. Then check if the place looks busy during lunch time and enjoy the delicious food. We hope that you enjoy it, and like we say here: Buen provecho! One of the things I miss in Costa Rica is the food! All of the dishes explained in this article are truly good comfort food. I’m not a fan of bananas but when I visited CR I seriously couldn’t get enough delicious plantains at every meal ! I tried them prepared several ways but enjoyed those that weren’t fried in a light batter. Especially loved eating them topped with sour cream at breakfast. Gallo pinto is another healthy yummy comfort staple that I can’t prepare near as well as the good cooks of Costa Rica ! (The first picture in this article is my favorite!). Thank you, JH! You are totally right plantains can surprise you so many ways that you can try them! A few weeks ago I tried a sushi roll made by plantain they called “Tico Roll”!!!! Glad you like them at the end! Thanks for reading! Hey Mike, You are right it fits for all kind of diets from vegans up to the healthy ones. You are welcome to explore Costa Rica anytime! We will be happy to take you to our favorite place for Casados! Pura Vida? We visited Costa Rica years ago and tried many of these, which were all delicious! We had a local driver who took us to all of his favorite places, and he introduced us to the ladies who were cooking. They were so nice and always took our daughter back into the kitchen to make her something special. It was a great experience! That´s great to hear! Yes, drivers know the good places to eat that is our philosophy and it´s nice to read that they let you daughter cook! You are welcome to come back anytime! Thanks for reading Karla, hope you can visit here one day to try it and let us know your thoughts! Costa Rica has delicious food. I enjoyed everything I ate when I was there. I am also used to eating all types of Spanish foods though. Thanks Holly! I am glad to hear that you like it! I loved how simple the food was in Costa Rica. Gallos, rice, beans, it’s just so easy and it’s all so good! I actually didn’t know what some of the dishes that I ate were called so I enjoyed reading this ahah! Nina, that´s funny yes that happened frequently my friends still write to ask me: what is they name of the plantain dish that we tried? I want to do it send me the receipt.haha. Thanks for reading!!! Yummilicious ??? I’ve been to Costa rica but havent tried muxh2of theur cuisine but live arroz con pollo and galli pinto ? Yummilicious nice word to describe them ? They really are! Thanks for reading!!! I missed my food from My tiquicia?….thanks for this article! I will definitely show the description of each dish to my students? Hey Karla! Thank you so much! It´s an honor to hear that you are showing to the students! Hope they can try one day!